In my case I think I'm going to have a good experience. 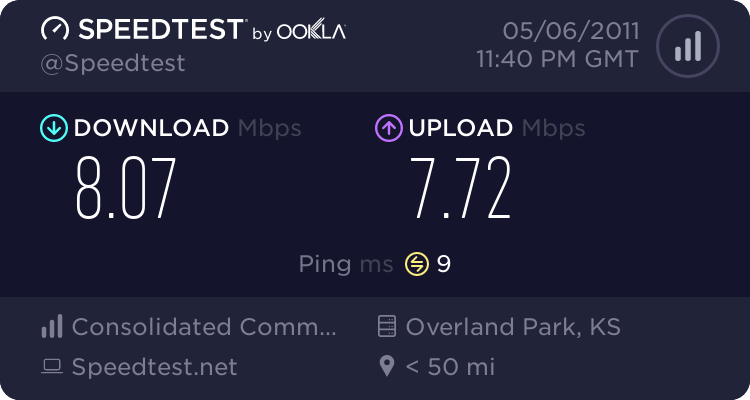 I've only had it a day so far so by no means a definitive indicator, but I learned for sure yesterday that the Internet service I get from SureWest in Olathe is not traditional cable but actually fiber to the home (a la Verizon FiOS)! I'm on the 8 Mbps plan (upload too!) and I'm sure getting the advertised speeds! I'm a bit surprised they don't make the fact that it's FTTH more prominent... if I had known that I wouldn't have even considered cheaping out and going with DSL (and dealing with the subsequent lack of customer service).